Puccini’s touching story of young love in a 19th century Parisian garret never fails to move audiences or attract top-flight singers. That’s why it is the most performed opera in the history of the Met. 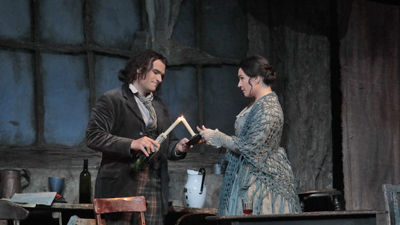 This cast is headed by two brilliant artists reprising the roles in which they made their Met debuts: ardent tenor Richard Leech as the romantic Rodolfo and radiant soprano Angela Gheorghiu as the tender Mimì. Carlo Rizzi conducts.